The Junior League of Greenwich hosted its 41st year of The Enchanted Forest fundraiser on November 16-18, 2017. This year’s beloved event hosted hundreds of families and brought the event “Home for the Holidays” to Christ Church Greenwich, across the street from Junior League of Greenwich Headquarters. The event would not have been possible without the participation and hard work of Junior League of Greenwich members, high school volunteers and many other supporters in the community. The Junior League of Greenwich would like to thank everyone in the community who came to shop in the boutique, bid on a tree, wreath, or gingerbread house, participated in a gingerbread house workshop, shopped in The Children’s Giving Shop, Met Santa, attended the Polar Express Pajama Lunch, attended the Thursday Night Sneak Peak or Friday Night Soiree, or participated in the online auction. Your participation and support allows the Junior League to continue supporting impactful community projects in Greenwich. 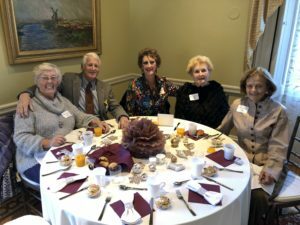 As is now a tradition with The Enchanted Forest, the Junior League of Greenwich once again reached out to its partners in the community and hosted seniors to a festive Senior Breakfast in the historic Tomes-Higgins house this year. The breakfast was picture-perfect, with elegantly decorated tables, a performer singing and playing the baby grand piano, and a delicious meal for 64 of the town’s seniors. People were chatting, laughing, and walking table-to-table to greet their friends. The Tomes-Higgins house provided a unique and special backdrop for the event, with many of the seniors staying to take pictures of the art, architecture, and antique furniture before leaving. All in attendance took home an ornament as a memory of the day and were granted free admission to The Enchanted Forest. The Junior League of Greenwich would like to extend a special thank you to the sponsors for the 2017 The Enchanted Forest: Christ Church Greenwich, Doran Brothers Moving and Self-Storage, Greenwich Catholic School, Greenwich Magazine Moffly Media, Horseneck Wine & Liquors, Little Pub, McArdle’s Florist and Garden Center, Miller Motorcars, Plum Pure Foods & Catering, Ring’s End, and Val’s Putnam Wine & Liquors.